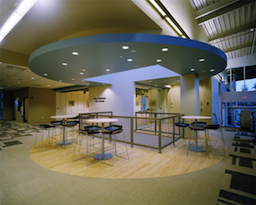 The 2,700-square-foot Pauly Friedman Art Gallery was dedicated on May 3, 2009 in honor of the late Pauly Friedman, who with her family, are among the University’s most dedicated benefactors. 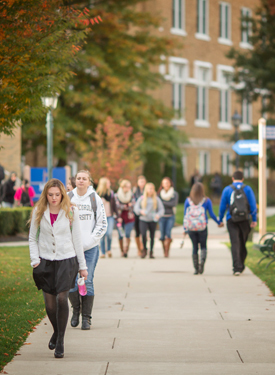 Carrying on a successful tradition of showcasing art on the campus, the University’s long-standing MacDonald Art Gallery, named after Marquis George MacDonald, was relocated within the Friedman Gallery. Brian J. Benedetti, gallery director, and Dona Posatko, curator, oversaw the Friedman Gallery’s grand opening on Aug. 22, 2009 with the highly acclaimed exhibit, “Guiding Light,” featuring extraordinary glass sculptures by legendary artist Christopher Ries. Benedetti served as gallery director until his retirement in 2015. Posatko was appointed gallery director in 2016 and held the post until she retired in 2017. Current director Lalaine Little took the reins in January 2018. Among the many notable exhibits over the past 10 years is the “Mary Wilson Supremes' Collection: The Gowns That Created a Musical Style & Legacy,” an exhibition in 2011 that featured 50 original gowns worn by the Motown icons. Wilson was on hand for the exhibit’s opening and later performed on campus in collaboration with the display. An impressive array of 323 Norman Rockwell Saturday Evening Post covers attracted hundreds of visitors to the Friedman Gallery in 2013. The works of Pablo Picasso (2014), Ansel Adams (2016) and Auguste Rodin (2017) also proved to be widely popular, as was a visit by Tibetan monks who created a sand mandala inside the gallery in 2015. Sponsored by Misericordia’s new Medical and Health Humanities Program in 2017, “Deadly Medicine: Creating The Master Race” was an exhibition on loan from the United States Holocaust Memorial Museum that addressed ethical atrocities in medicine during and since the Holocaust. More recently, the “America's Road: The Journey of Route 66” exhibition attracted more than 1,000 visitors who participated in a virtual cross country journey captured through signs, music and narratives in 2018. Entrance to the Pauly Friedman Art Gallery. The MacDonald Art Gallery is within this space as well. 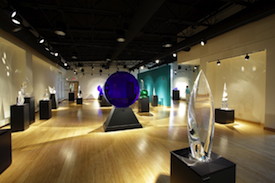 Guiding Light grand opening exhibition by international glass sculptor, Christopher Ries.